A short video from Ideas are Bulletproof Studio Network highlighting a visit with Shadowhawk Blades during the 2015 Tyler Rose City Comic Con. A short article highlighting Shadowhawk Blades in a local Renaissance Faire newsletter. A couple of college students chose me as the subject of their documentary profile project. Man of Fire - a documentary short from Tim Stevens on Vimeo. March 2011 issue. Artist profile on page 9. Full text available from Issue. Despite its mis-quotations, this article still did a lot to let the area know about us. 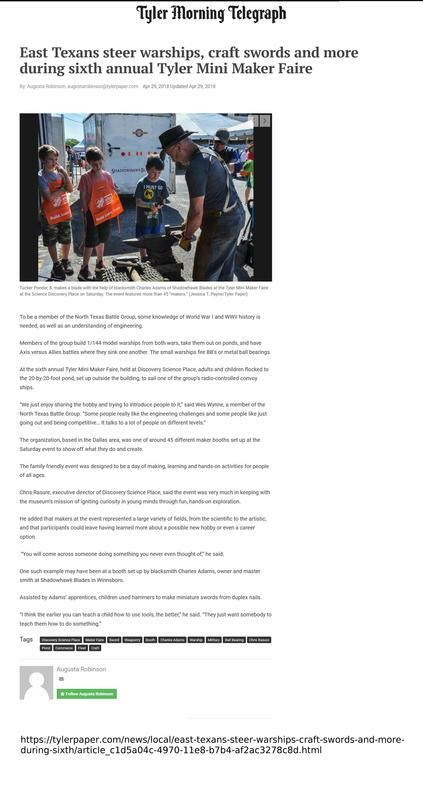 Article no longer available from the paper's website but the document here contains the full text. 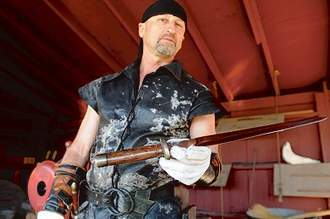 Written by a Journalism student, this March 2009 article features Shadowhawk Blades and Four Winds Renaissance Faire.